Date: 30 October 2013. Carrabelle Sparkles. The first thing you should know is I am not taken with drink... perhaps a glass or two of wine once in a great while, but I am stone cold sober when I tell you that the water in Carrabelle sparkles. It's the most amazing thing and you simply must see it too. Now I confess that this time viewing I'm a lot less unsure of the whole situation than I was in January when I first spotted the sparkles while anchored in Pearl Bayou. 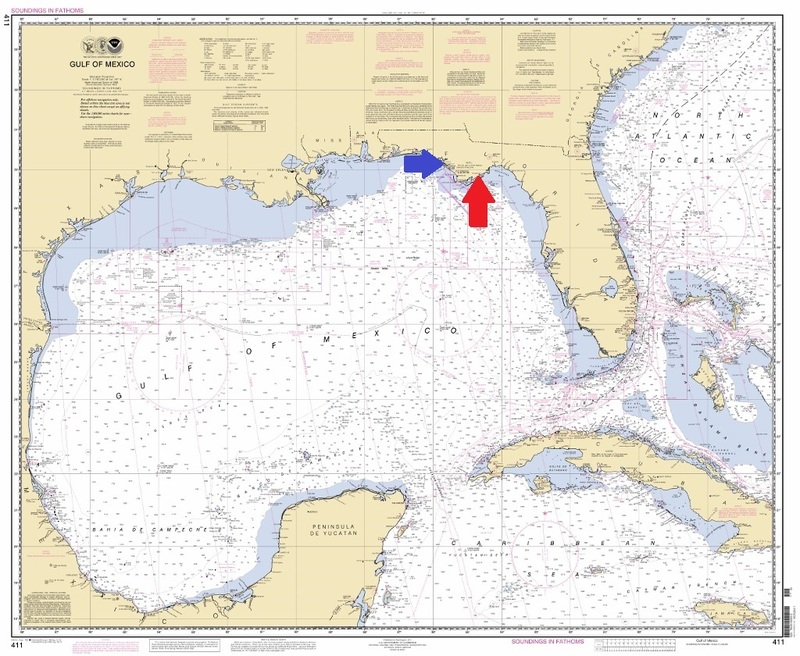 On the chart below Pearl Bayou is the blue arrow and Carrabelle is red. That said, it was also a bit spooky. There was a huge eagle (they are amazingly large birds) that perched on the top of a dead tree nearby so Skipper was always harnessed with her life jacket on and leashed. I worry that my Deck Swabbie will become a tasty morsel so am very protective of her. And (this was back in January so you can see how quickly I travel along, eh?) at the same time the pine pollen was falling in big chunks. Definition of big chunks: the size of a dime. And yes, that meant at least once per day wiping down the solar panel (had just one then) to keep incoming power supplies up. It was startling but honestly I thought it was my tired eyes playing tricks so I dumped the bucket of water on the swim platform and was amazed by tons of tiny sparkles! They were about the size of sparkler sparkles (like the kind you can buy for the 4th of July) and so I continued to dump water on the swim platform and watch the bouncing lights. Yes I am easily amused. Then I retrieved my cell phone and tried to take pictures and videos, but nothing showed. Not a doggone thing. Now tell me if you would at say 10 or 11 p.m. call your friends and say "I see sparkles on my swim platform"? This is not the sort of thing you share with friends -- not even the nice ones. And if I merely dumped the bucket of water into the bayou, it would glow in a round ball that sort of rotated about four inches in diameter and then gradually faded/disappeared. But the ball rolled too under the surface of the water. It was just the coolest thing to watch. One of my older books is a pocket-sized Golden Field Guide entitled Seashores that is a good choice for your boat bookshelf. It's small, light weight and filled with true-color illustrations of everything from hermit crabs and corals to prehistoric horseshoe crabs. 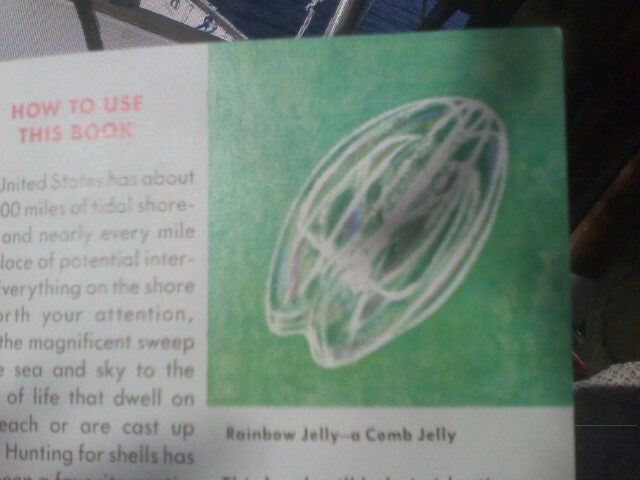 And even luminescent rainbow jellies are covered. The book was re-titled Seashore Life -- same book, newer cover. So yesterday in the Carrabelle River I was noting the tiny jellyfish and nothing clicked -- until late last night when I rinsed off the swim platform and again saw the sparkles. Life is good on the water and sometimes it's surprising and even delightful. So now you know too: Carrabelle sparkles! Boaters will appreciate that everything is right on the waterfront including a marine hardware store (Just Right Marine, and they are doing my engine swap) and the library, post office and a real albeit smaller chain grocery store too. It doesn't get much more convenient than that! Have you ever seen luminescent jellyfish? Where were they and do you remember the time of the year? A favorite aphorism: For every person with a spark of genius, there are a hundred with ignition trouble. Glenn A. Colemen.